At 1080 Pressure Washing, we understand that the first impression of your business could be the most important memory that a client or customer has about your business. The advantages of our pressure washing service is not just appearance. We also provide safe and clean floors, exteriors interiors and rooftops for your employees and customers. 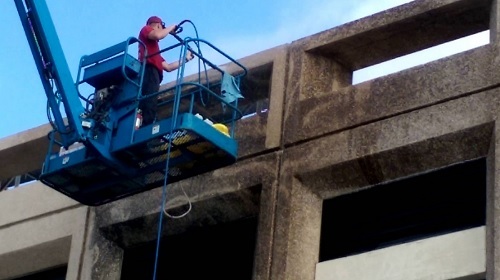 We offer the following commercial pressure washing services for our clients in the Atlanta, GA area. Commercial pressure washing for apartment complexes, warehouses, nursing homes, shopping centers, business park, office buildings, dumpster pads, industrial companies, parking lots and more. If you are in need of commercial pressure washing services in the Atlanta area, call the team at 1080 Pressure Washing. 1080 Pressure Washing is a leader in the Atlanta, GA area for our Commercial Pressure Washing services. We invite you to contact us to learn more about the services offered to restore and maintain your business interior, exterior and equipment. If you need Commercial Pressure Washing service in Atlanta, give us a call! As an Atlanta based business, we have had the pleasure of working with a diverse group of clients. From schools and universities to office building, apartment complexes and even high rise buildings. Our team of professionals are committed to providing you with a service that is unmatched by other Atlanta pressure washing companies. During the washing of your property or equipment, we will ensure that there are no disruptions of normal operations for your employees, clients, tenants or customers. We offer scheduled appointments every day of the week and around the clock. Give us a call and see why so many others have made the switch to 1080 Pressure Washing of Atlanta, GA.